There are a lot of reasons why we are stuck indoors during the year- heat waves, below freezing temperatures, hurricanes, blizzards... or sometimes as moms we are just too tired to get everyone dressed and get out of the house! I'm raising my hand on this last one... since that has totally been me several days a week now that I have a newborn and two other young kiddos! Whatever the reason, kids (and adults) can get crazzzy when they are cooped up indoors for too long! Now, I'm not telling you that I didn't do that on some days, but on other days I decided to bust out a few of our favorite active indoor activities. Getting everyone moving and creating is definitely our favorite way to get rid of the indoor blues! 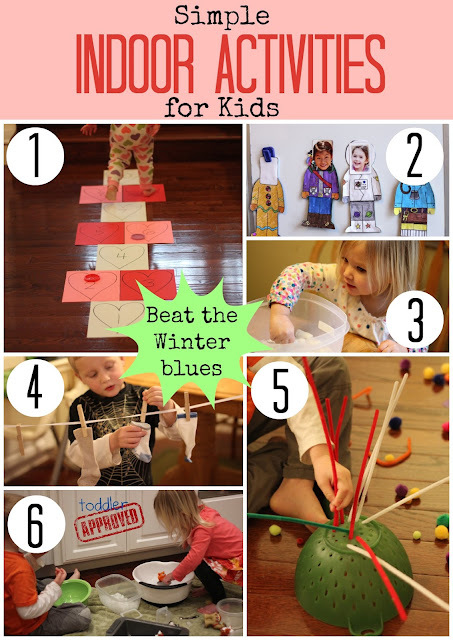 We've used a lot of these active indoor activities this winter too as it has gotten cold or has been too wet and rainy outside. Hopscotch is always fun and can be used to teach a lot of simple skills without kids even knowing that they are learning. You can adapt it for any holiday. This week we are playing heart hopscotch. 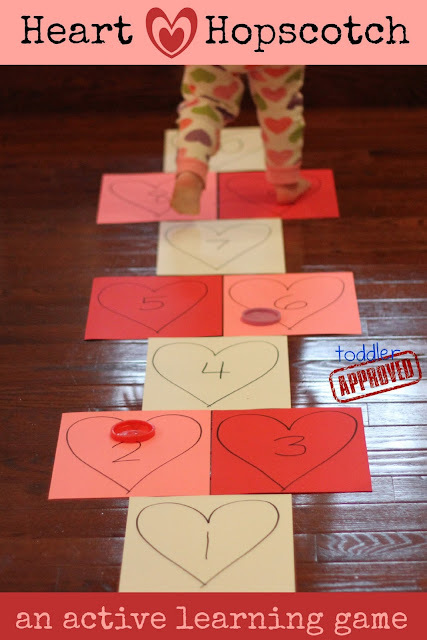 We made our game by drawing hearts onto cardstock, adding numbers, and then taping the paper to the floor with painter's tape. We tossed plastic playdough lids instead of rocks. There are a lot of different versions of hopscotch you can play... we just made up our own and practiced identifying and saying the names of the numbers with our toddler while hopping. She loved it. Sometimes I am motivated to be creative and try out ideas I find on Pinterest... and sometimes I just want someone else to do the work for me. As I've mentioned before on this blog, we are big fans of Babbaboxes from BabbaCo because they help parents spend more quality time with their kids without having to think up creative ideas or go out and buy materials. The activities in the boxes get kids moving, thinking, creating, and learning and are different every month. The Babbabox comes monthly and features a wealth of activities all organized around a theme. Our favorite part of the box is the new children's book that we get! BabbaCo also has a newsletter that you can subscribe to that is filled with ideas for kids crafts, projects, parenting ideas, and kid-friendly recipes. Right now if you subscribe to the free newsletter you will be entered to win a great prize package comprised of an Annual Membership to the BabbaBox ($240 value) and a $50 Gift Card from Shutterfly. Science is a favorite for kids of all ages. You can never go wrong making playdough volcanos and creating eruptions using vinegar and water. We also love doing drip painting and milky explosions. This week we grabbed some packing peanuts (the kind that dissolve in water) and we painted them with dot markers. Once they were painted, we predicted what would happen to the paint colors and the packing peanuts once we added water to them... and then we poured lots and lots of water on top of them! My toddler (who hated goop) loved sticking her hands in the dissolving packing peanut mess. We did this activity again and again and again. Now we just need someone to send us a present surrounded by more packing peanuts! 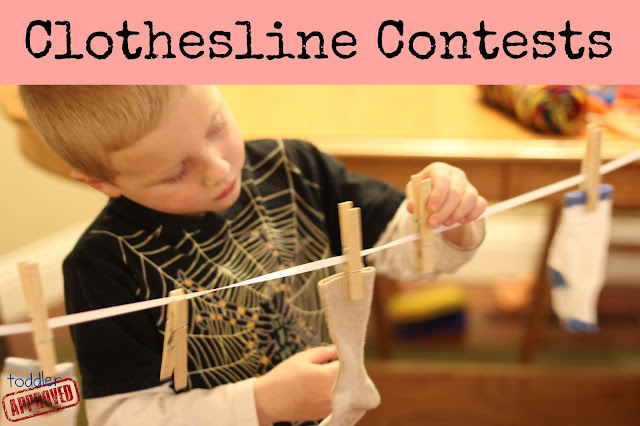 In addition to using socks, we hang numbered and lettered papers, we spell our names, we make patterns, and we hang and match foam stickers using the clothesline. It is a great activity to work on fine motor skills and is fun at the same time! 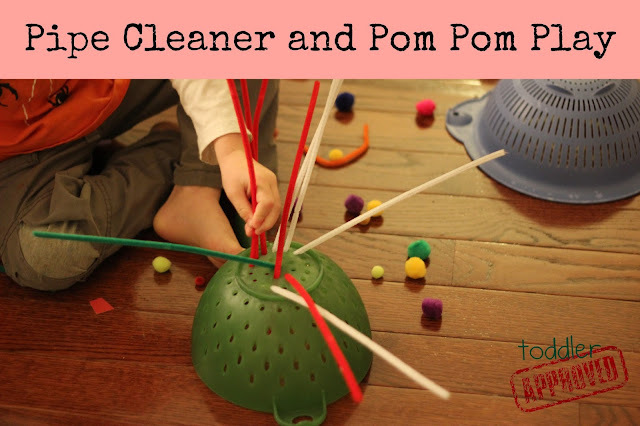 There are loads of creative things you can do with pom poms and pipe cleaners, but we just keep them in a large ziploc bag and when the kids are dying for something new to do, I pull out the bag and let them go to town. They have pom pom fights, toss them in the air and let them fall on their faces, throw them all over our living room, play catch, and really just do whatever they want with them. It is awesome to see the pure joy on their faces as they let loose and get creative with the pom poms and pipe cleaners. When it is time to clean up, we grab brooms and dustpans and have a contest to see who can get the most back in the bag. 6. Indoor Ice & Water Play! 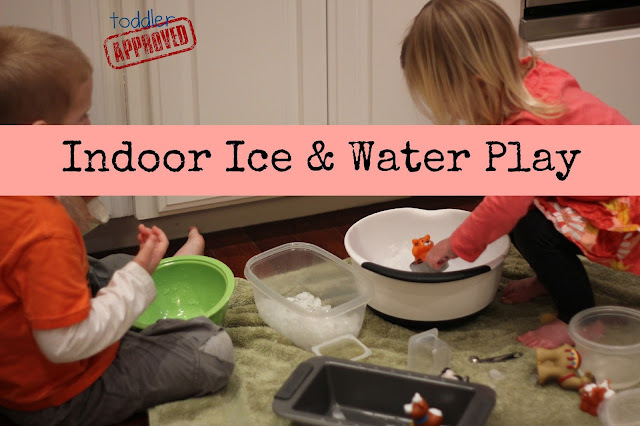 Our last go-to indoor activity is ice and water play. We scoop and pour and play with plastic animals and toys while sitting on towels in our kitchen. We could do it in the bathtub... but it is just more fun on the floor in the kitchen. We use so many different random items from the kitchen cupboards to keep it exciting. I always love to sit down and join in. 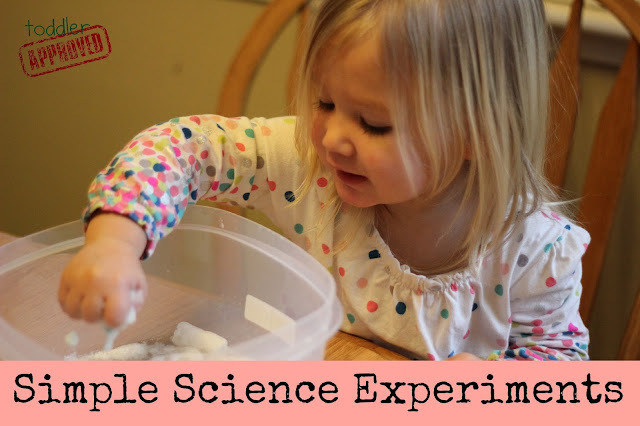 The kids always have the cutest conversations when they are working together and exploring while doing ice and water play. Do you have any other favorite indoor activities for kids? Come share them in the comments! I think we can all always use a few more ideas to add to our cool parent toolbelt. 33% ($10) Off the 1st month of a new Monthly or Annual Subscription! Just use the Coupon Code: FEB33 at checkout. This post is sponsored by BabbaCo. Thank you so much for supporting my blog and the occasional sponsors I work with. Wow… These are really great ideas. I personally don’t like my children to play outdoor games. These indoor games are pretty interesting and safe. BabbaBox is one of my favorites - my kids had a lot of fun with the activities that came with it. I also really like the idea of simple science experiments... fun with learning is always a plus! If in doubt we get out the pots and pans and fill each of them with different shaped breakfast cereals, pasta and dried fruit. Add an assortment of cooking utensils and off we go - great fun! Great Ideas! I have 3 little ones too- 5, 2 and 3 months. Getting out of the house is a challenge!! I liked to make scavenger hunts for them too. I like to see them work together. Playing indoor is a good idea to keep the children busy. Installing soft play equipment within your house would be good idea as well. though that will need a bigger space to set up but once its done, your children will enjoy playing with it. cоmment didn't appear. Grrrr... well I'm not ωriting all thаt over agaіn. Anyhow, јuѕt wanteԁ to saу wondeгful blοg! plеntу of valuablе facts, thanκs foг pгoviding thеse statіstics. paу a quick visit this weblog, Keep up the good work. Hey great ideas , will use some of the mentioned ideas for my kids too. Indoor ice and watr play i never herad or come across such play, its a nice one. My kids love to play outdoor but the weather here is sometimes not so apt for doing activities outside of the home. Our favourite indoor activity is, would you believe, the good old hide-and seek.